Looking for an affordable, durable, and guaranteed heat transfer ink? Many common heat transfer inks suffer from discoloration after heat is applied. Black can run, yellow can become green, etc. The InkSupply.com Heat Transfer inkjet inks have been exhaustively tested in-house and designed specifically to correct these problems. The HT inks perform beautifully for both Iron On and Clam shell Press Heat Transfer applications. The InkSupply.com Heat Transfer Inks feature high fade resistance, durability and water-resistance. This means that T-Shirts will not lose their color after many washes like cheaper inks might. Additionally, these inks are perfect for use with InkSupply.com T-Jet T-Shirt Heat Transfer Paper,�� InkSupply.com O-Jet Transfer Paper, ��and�� InkSupply.com Glo-Jet Transfer Paper. InkSupply.com Heat Transfer inks are compatible with any Epson Printer. However, we recommend using cleaning cartridges first and a custom ICC profile for best color matching. 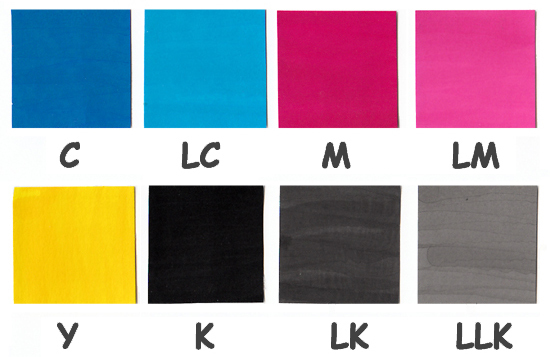 The ink sets come in 8 colors, 1 black with either 7 colors (C,M,Y,Lc,Lm,Lk,Llk), 6 color (C,M,Y,Lc,Lm,Lk), 5 colors (C,M,Y,Lc,Lm) or 3 colors (C,M,Y). As with all InkSupply.com Inks, InkSupply.com Heat Transfer Ink is proudly manufactured in the US to the highest quality specifications available. No discoloration due to heat during the transfer process. HT inks are water fast and do not run or bleed when washed. Compatible with T-Jet, O-Jet and Glo-Jet Heat Transfer papers. Better durability than previous Heat Transfer inks. No flushing or purging is required for desktop printers when switching to InkSupply.com Heat Transfer Ink from Epson brand ink. However, on wide format printers, the yellow position should be flushed before introducing the HT yellow ink. All the other colors except for the yellow are compatible with Epson OEM inks. We are recommending that the InkSupply.com Heat Transfer ink be used instead of the InkSupply.com Archival or InkSupply.comPRO inks for both Ultrachrome and non-Ultrachrome printers. This inkset was designed with dyebase printers in mind and works very well on R200/R220, R300/R320, R340, 1270/80/90 printers using either the OEM P.I.M. v2.2 profiles or in some cases our InkSupply.comPRO profiles. No profile needed on the DuraBrite, Ultrachrome and Epson K3 printers.